Crowd-funded space simulation game Star Citizen has now racked up one million players. Star Citizen was launched via Kickstarter in late 2012 and sought only $500,000 (£300,000) to get development of the game started. Supporters have given almost $93m (£60m) to the developers making the game. To mark the milestone, an early version of the game will be available free for those who already paid to support it. The next big release in the game's development will let players fly ships, battle and trade in a massive online universe. 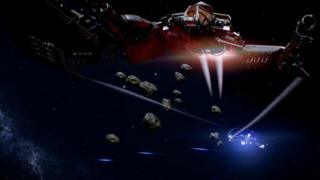 The involvement of veteran games maker Chris Roberts, best known for the Wing Commander series of games, drove interest in the project which had raised $24m by the time its Kickstarter campaign ended. Since then, fund-raising has continued on the main Star Citizen site as people have paid to get early access to the game as it is developed, and by buying star ships they will eventually fly around its persistent virtual universe. Early versions of part of the game have been released to give people an idea of what the finished product will be like. "When I first started on this adventure I would have never dreamed that we would ever [have] this many people and this much support in building Star Citizen," wrote Mr Roberts in a message on the game's website. In the open letter, Mr Roberts announced the end of the early access packages and that now the full game would be available to everyone that put down cash for it. Those that bought early access packages would get substantial amounts of in-game credits as compensation. As well as letting people explore and fight online, Star Citizen will also have a single-player, mission-based element called Squadron 42. Well-known actors including Mark Hamill, Gary Oldman and Gillian Anderson are providing voices for some of the characters in that game. Correction: An earlier version of this story reported that the game had reached one million backers, which should have said one million players.